There are loads of 'learn to code' resources on the web but it can be difficult to find something you can put to work right away to teach yourself or others. A while back I dove deep into the MIT AppInventor site to build an Intro to Apps course for middle school. I have presented a portion of it as one or a series of sessions at the AppsEvents Summits. 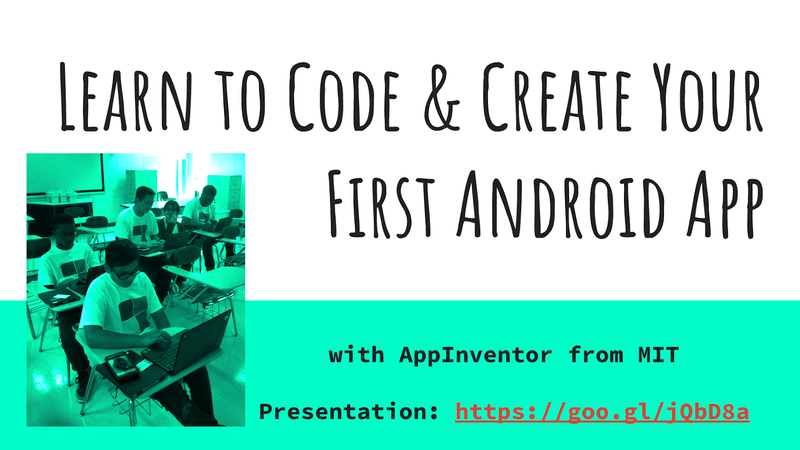 Feel free to use the presentation as it has directions for building two simple apps using the AppInventor interface on a Chromebook or Laptop. You can also install the MIT Companion App on your Android and sync it / run / test the app as you build. If you do this and want to have some more fun, level up and make the PONG App! The directions can be found at allisonmollica.com > Presentations > My First Android App at the bottom of the page.